KS Pond Services will cover from the smallest of pond to very large ponds. Here is examples of the smallest pond we have cleaned and the largest pond that needed tidying up. 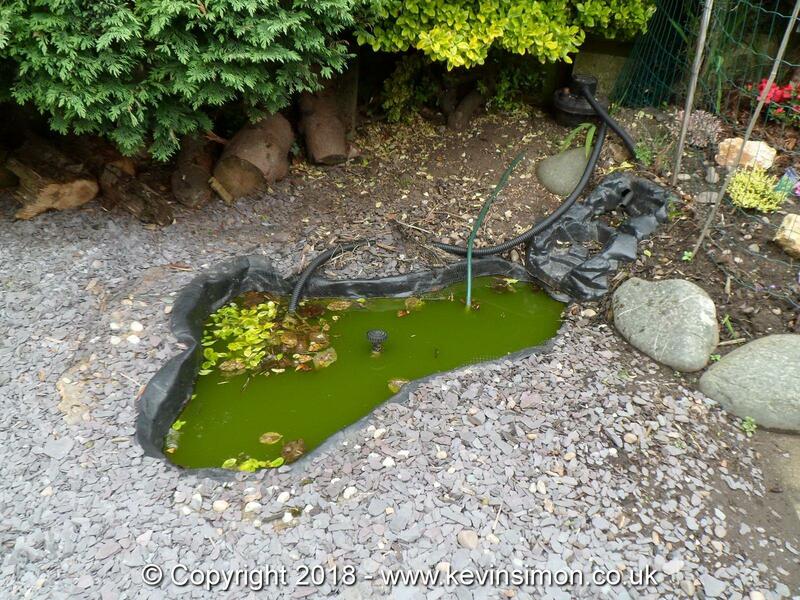 This small pond (approx 4ft x 2ft and approx 1.5ft deep) upon arrival was in a bit of a state with very green thick water from the build up of algae. This was because the pump hadnt been working for awhile, there was a small filterbox in the ground behind the pond, though the customer didn’t know that the UV light needed to be changed so hadnt been changed for over 2 years. He hadnt had the pump on for a few months this was beacuse when the pump was working he was loosing water. There was only one fish in the pond. The customer had brought a new pump the type with integrated filter and uv built into the pump itself. The job was to clean out and install the new pump. Normally I would save a much of the existing water as possible on this occasion this really wasn’t an option. At the time of my visit I had no direct connection to an electrical socket as the customer was out. So this meant I couldn’t use my pump to pump out the water, so used buckets. The water went down the drain with my net over the cover, this was incase the fish accidentally got scoped up in the buckets. As the water was that bad you couldn’t see the fish. Though the fish was easily caught with my net and kept safe in a spare bucket. It only took around 10 buckets to empty the pond. 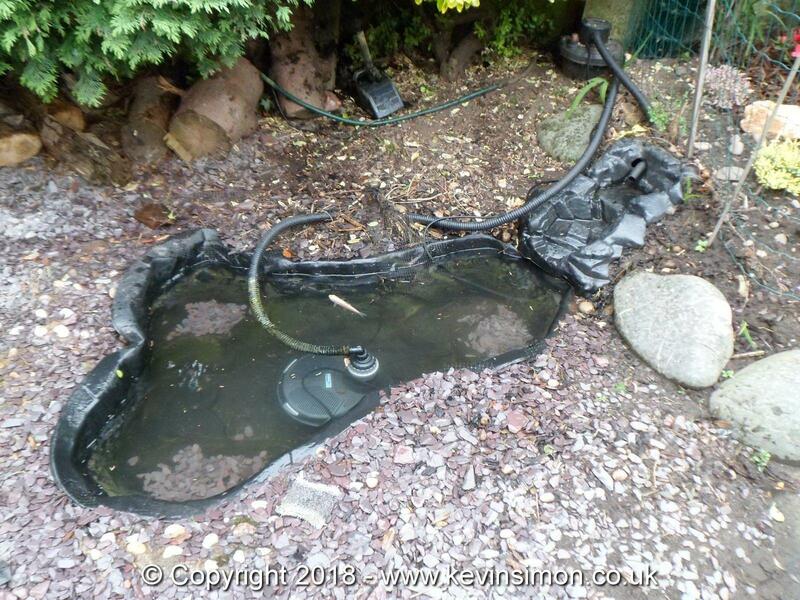 Once empty I normally use a pressure wash to clean the sides, as no electric supply I had to scrub the sides by hand as this is a preformed plastic pond this was pretty easy, then once done and fully cleaned the pond was fully emptied. While filling up from the hose I could wire in and setup the pump. I discontinued the old filter and pump, on the old filter there was a crack in the unit which is why the customer was losing water from the old setup. Once filled use a small amount of declorinator this settles the tap water so safe for aquatic and plant life. This really only needs doing if using fresh water to fill up the whole pond. Once filled put the fish back into his new clean home and checked the pump was working fine and adjusted pipework into waterfall as needed. This is one of the largest ponds I have had to deal which is approx 45ft x 70ft approx, though only about 3.5ft deep. The owner of this pond, well really a lake 🙂 had moved in only 12 months before my visit and it was really over grown with reeds and the water had green algae bubbles on top of the water. The job was to clear a lot of the reeds and sort out the green water. I think when this pond was built they had just planed reeds within the pond and over the years the root systems had completly taken over the bottom of the pond. On the first visit to this pond I got in with waders and cut back to the roots of the reeds. I took out approx 75% of the reeds, so that when water flowed from the waterfall it had a clear path for movement down to the other end. this then allowed better water flow as well as more oxygen in the water. The 2nd visit approx 6months latter as the reeds had grown again this time I took out the root system of reeds as well the the tops. The green algae bubbles on the water suffice is more to do with chemical inbalance in the water. This is basically beacuse of so much dead plant matter and new growth of plants. Some times the way to deal with this is to use chemicals to get the right chemical levels in the water, but because the pond does loose a bit of water and fresh water coming in each day, this wouldnt work in this situation. The pond does loose a bit of water but, there is a waterfall that can be feed by a submersible pump in a natural brook running across the bottom of the garden. This is on for only about 30mins per day, which does keep the water at a reasonable level. 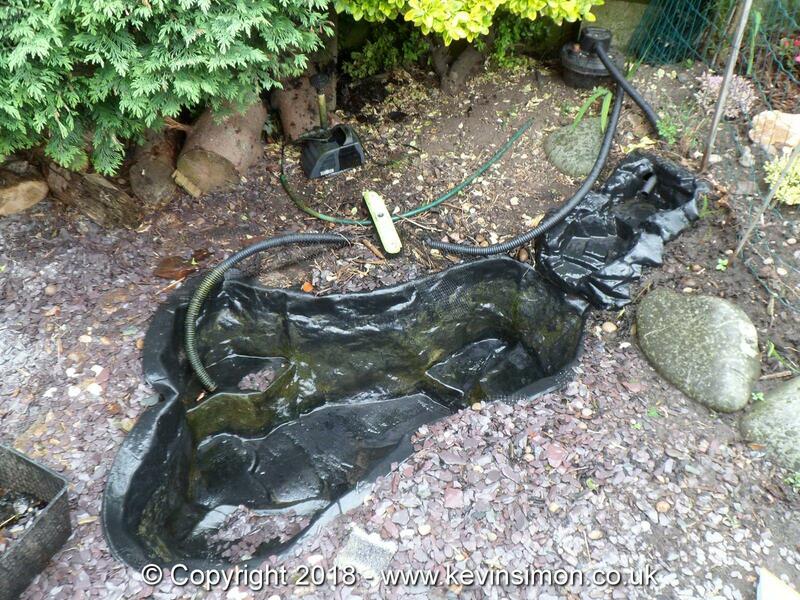 The liner in large parts has perished, but the pond has been in over 10 years I would say and really the liner isn’t a proper pond liner, it is basically building plastic sheets, that has cracked over time. As this is a large pond, to replace the liner would be to expenisve, as there is a island in the centre that is about 2mtrs wide and from the base of the pond about a meter high, so would need to be emptied and all that moved and relined, which would be a massive cost. So just running the pump for 30mins a day is the best option with this pond. After the reeds had been moved out this did help with the green algae bubbles as well as the better water flow. Unfortunately with this pond, the only way to keep this under control is every 6 months to keep taking out excess reeds and root systems. This will never have complely clear water as really no way because of the water loss and adding more water each day any way to add a filtration system to it. While i was dredging the water there were some fish in the pond but really only a few inches and this is more of a natural feature pond. Also the island in the centre had been cleared though on the first visit this couldn’t be done fully as there duck eggs in a nest, so this was left.